"Simon...lovest thou me...? 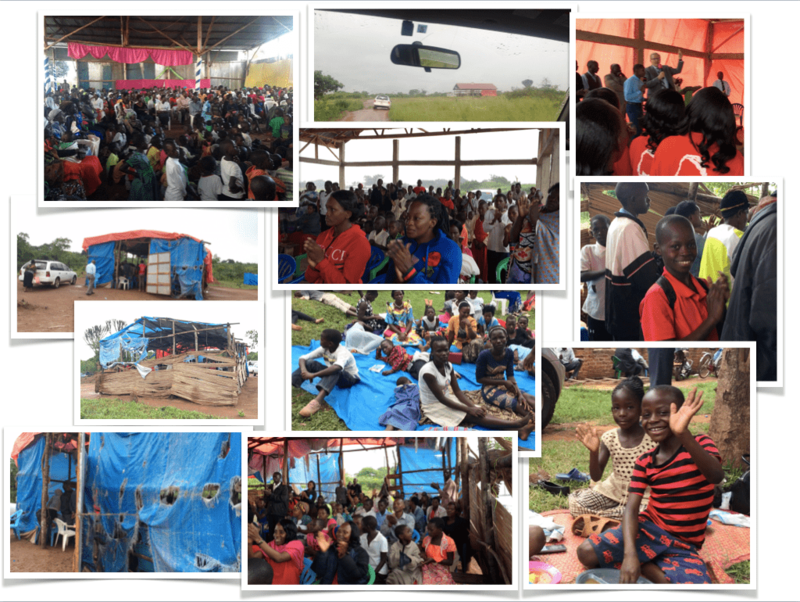 Feed My Lambs"
Almost 2000 recently baptized believers gathered near Kampala in May 2018. Thousands of lambs have been birthed and are crying out for food for their souls. With your help Bible Believers is rising to the challenge of supplying this extraordinary awakening that has begun. The simple act of feeding God’s children is one of the greatest expressions of love a believer can offer to Him. As we examine the amazing phenomenon of the spiritual awakening in Uganda, we find a vast array of needs—natural results of a move of the Holy Spirit that is happening at amazing speed. You will hear of many needs in this article, but at the heart of all of them is the need to get the life-giving Word into the hands of the people. The need is both vast and urgent. With over 3000 new baptisms in the past 6 months and more happening as we write, there can be no delay. Our policy has always been to work in close cooperation with the local ministry in the country to find the best ways to get the Message into the hands of the local people. In Uganda we have have a long standing relationship with Brother Fred Kiyingi and Brother Stephen Ibale, two senior pastors long established in the Message of the Hour. After conferring carefully with senior ministers in Uganda, we have begun to meet the need by printing 5000 Exposition of the Seven Church Ages Books in the Luganda language to be shipped directly to Uganda. While the books will soon arrive, this is only the beginning. There is a need for an equal number of The Revelation of the Seven Seals books and for translation and printing individual titles. In the Prophet’s Ministry, the Exposition of the Seven Church Ages was the last thing to be released, following a 30 year ministry of teaching, preaching, and the attending miracles. We are glad the Church Ages Book is available, it has a great place in grounding new believers in the Word. While this book and the Revelation of the Seven Seals are printed commercially, the Message Hub will play a key role in the effort to translate, print, and distribute individual Messages. There are at present 112 translated messages on the Message Hub that serve the Believers in Uganda. Fifty-seven of these are in the Luganda language, and 65 are in Runyakitara, another of the several languages spoken in Uganda. Translation is difficult work requiring skill, concentration, and spiritual discernment. As many translators as possible are needed, and for that reason we are helping to support translators in the Luganda language. Translation and printing in the Runyakitara language is already supported by Edmonton End Time Message Tabernacle and is being uploaded to the Message Hub for further distribution and inclusion in the Message Hub Mobile Application. Once a Message is translated and carefully proofread, it can immediately be made available on the Message Hub. But this is only one avenue in a supply chain that must be broad enough to meet a population with various needs. Access to the Message Hub is limited by both internet availability and devices—devices which many people in Uganda do not have. Internet in Uganda is still a challenge, though improving gradually. Therefore printing and distribution of old fashioned paper message books must continue, and expand. To do that requires hardware and equipment such as printers, computers, cutters, staplers, and consumable paper. For larger books such as the Revelation of the Seven Seals, funds are needed to secure printing runs at professional facilities. The finished materials can then be transported to outlying areas where new Believers are eagerly waiting for them—areas that are expanding at a rapid rate. At this time, we are making an effort to raise $55,000 to cover the first 6 months of translation work and printing. This is only the start of an ongoing operation that we expect could require up to $200,000 once all the needs are considered. Part of Project Uganda is to equip Message Ministers with the tools necessary to preach the Word to their people. There is a definite shortage of books and audio sermons of Brother Branham available in the country. In his recent trip to Uganda, Brother Tim Dodd took a survey of existing ministers and found that on average ministers had only 21 audio sermons and less than 10% of ministers had a computer. This, along with the fact that the average minister had only 10% of the entire Message in book form, revealed a lack of material for ministers to study. Even as we work to supply new believers with the spiritual food so necessary to their growth, outreach is expanding into new areas, and shows no signs of slowing down. The current outreach method is for Pastor Fred Kiyingi to travel with a group of solid Believers from his own church to meetings at scheduled locations. The team puts on a service preaching the Word of the Hour. The team is self-sufficient and brings their own sound system and performs special music. Even a generator is taken along as many places do not have their own electricity. Due to the condition of roads in Uganda, travel is difficult and it can take many hours to go relatively short distances, and may require overnight stays. But this is the method of outreach God has been blessing with fruit. At these meetings the Message is both preached and demonstrated, and the spiritually hungry are responding. Miracles take place as lives are transformed, and faith in the Word is received by the only God-ordained method: the hearing of the Word. Even as Brother Fred and his team travel to new places, there is a constant call to return to villages they have previously visited, to offer more services and more Word teaching. There is so much to be done that Brother Fred and his team could be doing this full-time, but that is impossible due to his responsibilities in pastoring his own church, maintaining the radio broadcast, and doing translation work. All this is done while his health is unstable, and he often must take days off to recover. Pray with us, for the health of brother Kiyingi, and for new laborers to enter this white harvest field. While we were preparing this article an emergency request came in for the aid of two pastors. One of them was denied the right to rent a school where he was holding services, due to pressure from a Pentecostal organization. The other pastor’s church was demolished and he was evicted from his home. This is a common occurrence as pastors often own very little; property titles are held by the organizations. In other cases, there have been death threats. We met and interviewed some of these Pastors at the new believers meeting in Kampala in May, 2018. Their recorded testimonies are among those viewable HERE. Additionally, in many of the villages where the Word has been received, the new Believers have since been evicted from their denominational churches, and are meeting in hastily constructed shelters made of plastic and sticks–whatever can be found, or even in the open air. In some cases the senior pastor is with them, in other cases it is a junior pastor or simply elders who are carrying on with the newly formed church. Uganda has seasons during which scarcely a day passes without several torrential rainstorms. When this happens, the congregation simply carries on as best as they can. There is an immediate need for basic shelter for these groups; simple dependable structures that can function as churches. The open-walled structure that we helped build for new believers in Kimaga is a model of what can be done. It gives the new believers a dry place to function, and over time, they can improve the building. At this time, there are up to 30 groups in need of some type of building. Many of these believers are so poor they don’t even own a Bible of their own, and if they did, it would be a special treasure they would want to keep dry, which would be difficult in open air meetings. The church building in Kimaga was constructed for $10,000 US including land, and can support a church of about two hundred believers. This is a very low cost compared to what it would require to build a church in developed countries. The lessons learned from the construction of that church could be carried over to other projects. The early beginnings of the current revival can be traced back to that very church, in Kimaga. These two churches, Kimaga and Migyera are in close proximity. No one knew at that time what would soon unfold, but now the first church of the revival has a building that other groups can use as a model. With that experience in hand, any funds we can raise for the construction of more churches would be sure to be used efficiently. It was at our visit to Migyera that we discovered how real the lack of Bibles among Ugandan Believers truly is. In the leaky structure they used as a church, almost no one owned a Bible in which to turn to the scripture that was being preached. In our visit to several other places we began to see the same situation. In the remote region of Manafwa where many of the recent baptisms took place, we spoke with the pastor and members of his congregation. In the video below, this sister, with her pastor standing by, offers a commonly heard plea: Bibles and Message Books. How striking it is, that in a country where at times, there is not even enough food to eat, we heard not one request for natural food. Only for Spiritual food. The Manafwa church demonstrates that in many areas, the people do not need a lot of material things to thrive spiritually. This tiny mud-brick structure is situated near some of the most central moments in the revival. Not long ago, nearly 500 people were baptized in one meeting in this area. In remote areas such as this, people are accustomed to living without electricity or running water. But they can’t live without the Word, and somewhere to meet. A simple dry building, with fervent believers is enough to sustain a healthy church. To support the work in Uganda and you live in Canada, please contribute to Cloverdale Bibleway by using the button below. If you live in the USA or beyond, please use the Bible Believers button below. God bless you!